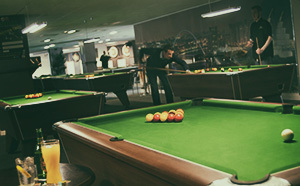 Groups and Parties at the Hustler Pool Club in Newcastle upon Tyne. At the Hustler, we love to spoil our group visitors. Perhaps you’re organising a social work event, corporate entertaining, stag or hen night or simply a special get together, birthday or celebration. Whatever your event our team will tailor the evening to your requirements. We will reserve pool / snooker tables, organise food for your party, even supply you with your own chilled bottle-bar so there’s no queuing at the bar or hassle working out who’s round it is! We can even organise a mini-tournament for you with end-of-night presentations and special Hustler trophies for the winner and runners-up. The team will be delighted to accommodate your needs for your special event. We have the experience to make sure that your group event will be a huge success and great fun. It’s not just larger groups we cater for, those serious about their snooker can pre-book tables, food and enjoy waiter service at no additional charge. Got your own cue? Our team will happily store it for you, ready for play the next time you visit. We’ve three party packages you can choose from, or call us and make your own! Give us a call on 0191 2410660 and we’ll get started organising your event. Food at the Hustler is served from 11am – 10pm everyday. Our menu changes regularly so the selection below is an example of what you can expect. All food is freshly prepared to order so please allow us a little time to make your lunch or dinner for you to really enjoy. This is just a small selection of what we serve, we also have a daily specials board too! Don’t forget our team at the Hustler can take you food orders in advance for small groups and parties. Your meals and drinks will be ready within a few minutes of your arrival so you can fuel-up for that big game or simply fill-up on a fun night out! A single shot e.g. jagermister, sambuca, tequila etc. (on selected drinks only). …of Snooker, American Pool or English Pool. Tortilla chips topped with jalapenos, salsa, chili-con-carne, guacamole covered in two types of melted cheese with cooling sour cream. If you have any special dietary requirements or allergies, please let us know. Bottled/draught beer, single spirit with mixer, small glass of wine or soft drinks (on selected drinks only). Mixed platters of mini burgers, mini hot dogs, selection of paninis, garlic bread and The Hustler Nachos. Single shot of jagermister, sambuca, tequila etc.. OR bottled/draught beer, single spirit with mixer, small glass of wine or soft drinks (on selected drinks only). …of Snooker, American Pool or English Pool (can be mixed together). Choose from 2 of the following:- chicken curry, vegetable curry, chili-con-carne OR sweet ‘n’ sour chicken all served with rice, garlic bread, mini burgers, mini hot dogs, paninis and salad. 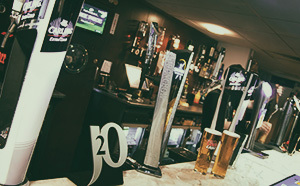 £5.00 drinks voucher to be given to all members of the party to spend on any drinks they want.